Shawnee Peak's Annual Gift Card Sale is going on through 11/24/10. Buy any gift card, valued at $100 or more and Shawnee Peak will add 10% to its value. 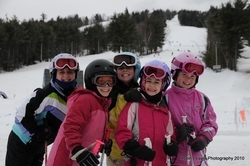 Kids LOVE Shawnee Peak - Gift Cards are a great way to give kids money to spend! Shawnee Peak Ski Area in Bridgton, Maine, is offering an incredible deal for holiday gift-giving! Buy a $100, $125 or $150 Gift Card and Shawnee Peak will add 10% to its value! This offer expires on Wednesday, November 24 (the day before Thanksgiving) at 4pm. Shawnee Peak Gift Cards can be used for any purchase - tickets, rental equipment, lessons, day care, lodging, food & beverage and season passes. Unlike other merchants' gift cards, Shawnee Peak Gift Cards never expire or lose their value! Every year, more and more people purchase Shawnee Peak Gift Cards, because they know that Shawnee Peak always offers superior snow conditions and unparalleled levels of service to all skier and riders. Some folks will purchase the gift cards during the November Gift Card Sale for themselves and use them during the season - essentially getting a 10% discount each and every time they use their Gift Card! Avoid the mall and give the gift that everyone loves! Surveys show that gift recipients appreciate "experiential" gifts vs. more "stuff," which may clutter the house and get relegated to the dreaded "re-gifting pile." Skiing and riding are incredible outdoor activities that the entire family can enjoy. Very few sports bring families together like skiing. Imagine 10 full minutes on a chairlift with your child! You'll have her chatting about everything from school to sports to boys in a matter of seconds! Gift Cards are a great way to give your kids money for purchasing food items at Shawnee Peak, without risking your cash! In addition, Gift Cards are always replaceable (with your 15-digit issuance number). Purchase the Gift Cards online before 11/24/10 at 4pm or call 207-647-8444 with your credit card.